Alright guys. I hope this isn’t something I should be able to readily identify because I have no idea what it is. Someone help me. I don’t know what the other thing is either. They were both by the water heater and the weird long shaft was part of its plumbing. Im not sure why my pics got all messed up like that. Juan the extreme closeup and your lack of detail are why you have had no response. The lower picture is of a air hammer arrestor from what I can tell. That is what I was thinking Bob. Do you have any other pictures??? Those are my only pictures. I thought being zoomed in would be better. There really isn't much else to see if i was zoomed out. Bob, you are right. It is an air hammer arrester. Isn't it kind of useless if it is placed right next to the water heater? I have no idea if it is even connected directly as all i see is a copper line with plywood in one shot and aluminum foil around pipe in the other. Is this an attic as that's what it seems like? I promise nobody can tell you much more based on what is told or shown. Not trashing but this is one of the reasons I take so many pictures that others think are never needed.Truth told I was a little mystified by a 2 water heater setup from today and going to download my shots to play detective from the big screen as the seller was angry listening to all the issues and had bullets laying around with my client a ex veteran even nervous around the guy...lol. Point is I can be distracted once in a while and great shots make it like I am back there looking again. Yeah I take more and more every time I go on an inspection and they seem to save my *** sometimes. You helped me enough with the water hammer arrester and I dont think any amount of pictures could have helped solve what that other thing is. 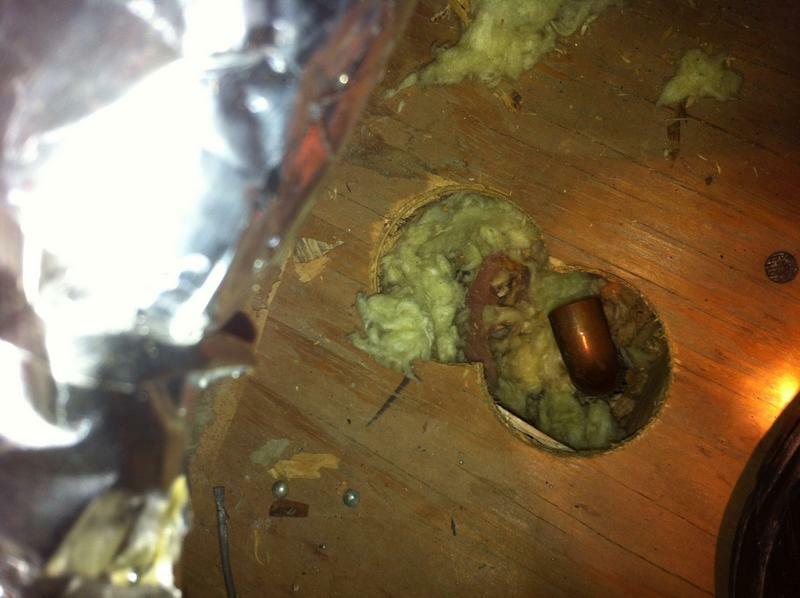 It was just a piece of copper piping coming from under the box the water heater was on. I have no idea where it came from or what it was doing there. Juan make sure to call this out if there was no drain pan and in an attic... terrible place for location which may have many issues. Have a feeling you will get more response now. 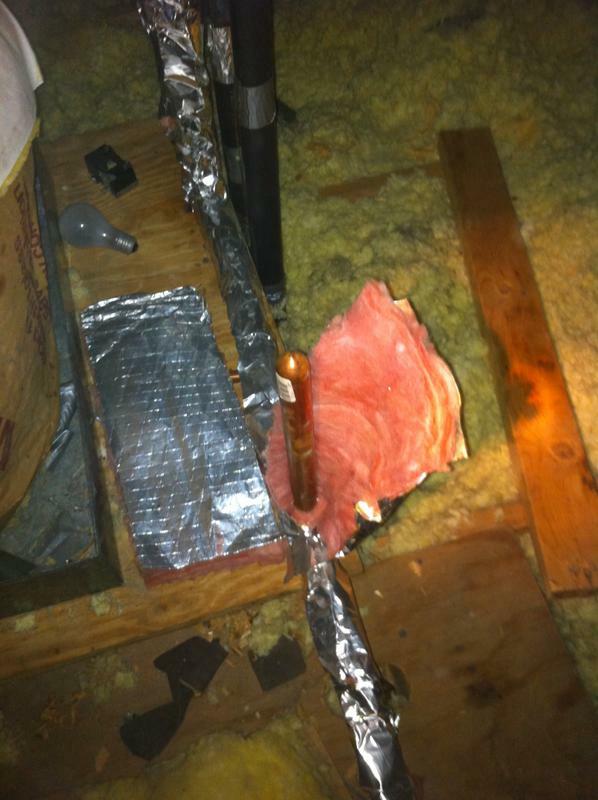 Juan: The "weird long shaft" in the second photo is a plumbing "Stubb" or "stubby." They are used to rough-in plumbing at the terminus of the plumbing lines for fixtures. They are a 90 degree, and some have a nailing clip on the side of them to nail into the joists. Saves having to solder a 90 elbow, cut a piece of pipe and solder on a cap. Not sure what's going on with it in your photo, though. Maybe a future water hookup?? Wait...I thought it was air hammer arrester. That's what I'm going with. You don't think it is? Bob. It did have a drip pan but 1) it was also the receptor for the tpr discharge pipe and 2) it was piped to a hole in the soffit. It didn't go down to the ground or anything. Is that allowed? I wrote them both up as defects and safety hazards. 501.2 Water heater as space heater. Where a combination potable water heating and space heating system requires water for space heating at temperatures higher than 140°F (60°C), a master thermostatic mixing valve complying with ASSE 1017 shall be provided to limit the water supplied to the potable hot water distribution system to a temperature of 140°F (60°C) or less. The potability of the water shall be maintained throughout the system. Drain valves for emptying shall be installed at the bottom of each tank-type water heater and hot water storage tank. Drain valves shall conform to ASSE 1005. 501.6 Water temperature control in piping from tankless heaters. The temperature of water from tankless water heaters shall be a maximum of 140°F (60°C) when intended for domestic uses. This provision shall not supersede the requirement for protective shower valves in accordance with Section 424.3. 501.7 Pressure marking of storage tanks. All hot water supply systems shall be equipped with automatic temperature controls capable of adjustments from the lowest to the highest acceptable temperature settings for the intended temperature operating range. Water heaters shall be installed in accordance with the manufacturer’s installation instructions. Oil-fired water heaters shall conform to the requirements of this code and the International Mechanical Code. Electric water heaters shall conform to the requirements of this code and provisions of the ICC Electrical Code. Gas-fired water heaters shall conform to the requirements of the International Fuel Gas Code. 502.2 Rooms used as a plenum. 502.3 Water heaters installed in attics. Attics containing a water heater shall be provided with an opening and unobstructed passageway large enough to allow removal of the water heater. The passageway shall not be less than 30 inches (762 mm) high and 22 inches (559 mm) wide and not more than 20 feet (6096 mm) in length when measured along the centerline of the passageway from the opening to the water heater. The passageway shall have continuous solid flooring not less than 24 inches (610 mm) wide. A level service space at least 30 inches (762 mm) deep and 30 inches (762 mm) wide shall be present at the front or service side of the water heater. The clear access opening dimensions shall be a minimum of 20 inches by 30 inches (508 mm by 762 mm) where such dimensions are large enough to allow removal of the water heater. 503.1 Cold water line valve. A means for disconnecting an electric hot water supply system from its energy supply shall be provided in accordance with the ICC Electrical Code. A separate valve shall be provided to shut off the energy fuel supply to all other types of hot water supply systems. Such valves shall be installed in the shell of the water heater tank. Temperature relief valves shall be so located in the tank as to be actuated by the water in the top 6 inches (152 mm) of the tank served. For installations with separate storage tanks, the valves shall be installed on the tank and there shall not be any type of valve installed between the water heater and the storage tank. There shall not be a check valve or shutoff valve between a relief valve and the heater or tank served. 504.6 Requirements for discharge piping. Where water heaters or hot water storage tanks are installed in locations where leakage of the tanks or connections will cause damage, the tank or water heater shall be installed in a galvanized steel pan having a minimum thickness of 24 gage, or other pans approved for such use. 504.7.1 Pan size and drain. The pan shall be not less than 1.5 inches (38 mm) deep and shall be of sufficient size and shape to receive all dripping or condensate from the tank or water heater. The pan shall be drained by an indirect waste pipe having a minimum diameter of 0.75 inch (19 mm). Piping for safety pan drains shall be of those materials listed in Table 605.4. The pan drain shall extend full-size and terminate over a suitably located indirect waste receptor or floor drain or extend to the exterior of the building and terminate not less than 6 inches (152 mm) and not more than 24 inches (610 mm) above the adjacent ground surface.